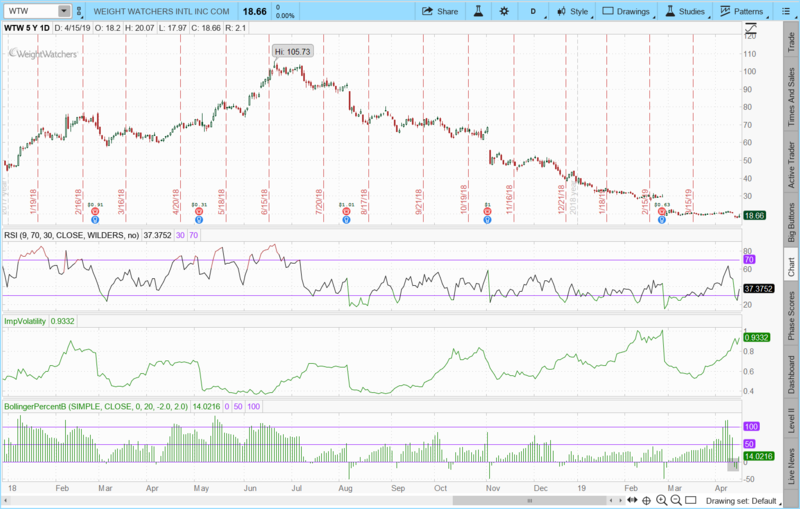 Dirt cheap valuations and oversold technicals make for a counter trend long in WTW stock. Shares of Weight Watchers (NYSE:WTW) finally look to have found their footing after a nasty drop. Weight Watchers stock had fallen nearly 60% this year before rallying yesterday. Certainly some of the selling was warranted given the slowing subscriber growth and increased competition. Now, that selling has come too far, too fast. Time to play for a pop in Weight Watchers. The impetus for the rally yesterday was an encouraging note out of Morgan Stanley. 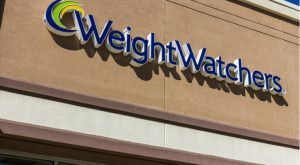 Analyst Vincent Sinisi looks for Weight Watchers to have roughly 4.5 million subscribers in Q1, which is in line with company guidance. Mr. Sinisi views this as a constructive sign. This is in contrast to an earlier second downgrade out of JP Morgan that had torpedoed WTW stock on April 10. WTW stock is now sporting a P/E under 6, which is by far the lowest valuation over the past 10 years. Other metrics, such as price/sales and price/cash flow, are also at historically cheap levels. Weight Watchers stock is looking comparatively much more attractive at these multiples. Shares are also looking a lot more compelling from a technical perspective. The 9-day RSI reached oversold levels before strengthening. Bollinger Band Percent B turned negative before heading higher. More importantly, WTW stock finally had a solid up day yesterday after four straight days of lower closes. This often signals that the sellers may have finally become exhausted, especially after such a punishing drop. Implied volatility (IV) is also near the recent highs, trading at the 88th percentile. This usually is a bullish indication that the downside fear has gotten a little overdone. It also means that option prices are comparatively expensive. There has also been a big repeat buyer in the May 20 calls over the past three trading days, with over 20,000 contracts trading versus only 648 open interest before the buying began. Stock traders should look to buy an oversold and underloved WTW stock near current levels. Selling May $20 calls against the position would lower the risk in front of earnings while still leaving upside open. Option traders may want to take advantage of high option prices and sell the May $17.50/$15 put spread for 70 cents credit. Maximum gain is $70 per spread with maximum risk of $180. Return on risk is 38.88%. The short $17.50 strike price provides a 6.2% downside cushion to the $18.66 closing price of WTW stock. Earnings are expected May 2 with consensus of a loss of 27 cents per share. Article printed from InvestorPlace Media, https://investorplace.com/2019/04/time-to-nibble-on-weight-watchers-stock/.